The Moon remains in Capricorn today and the effects from the Last Quarter Square stilll reverberate today (see yesterday’s Daily Astro for more information). Venus and Mars are all right, bumping up against each other, getting incendiary in Aries, but the Capricorn Moon squares them both. The Moon squares Venus at 3:13 AM EDT , then squares Mars at 6:35 AM EDT, which begins a Void-of-Course period that lasts until tomorrow at 4:41 AM EDT. This setup reminds me of situations where you’re bursting with enthusiasm over something, perhaps a new relationship, new clothes, or some new interest, and one of your friends comes over and starts arguing with you about why the relationship/item isn’t going to last, why it’s not practical, and just generally pisses you off because they’re missing the point. The point is, you’re excited and happy over something new and they’re stomping on that little spark of joy. Don’t let it bother you; as the Moon is void whatever annoys you today won’t amount to much anyway, (aside from irritating the crap out of you temporarily). Since the North Node in Scorpio forms an inconjunct with Mars in Aries, we’re bound to encounter some touchy situations related to power/control issues (Mars is ruler or Aries and a co-ruler of Scorpio), so we may need to adjust the way we project our energy outward. If we can learn to work with these energies, we may find that the problem person or blockage turns out to be our best ally or provides one of our greatest learning experiences in the long term. That Moon/Mars square can incline towards overreaction, so count to 10 before responding to any provocation. It’s one of those days where people are looking for something to rant about, so sidestep them and just do your own thing. With 4 planets in hotheaded Aries, the angry outbursts may be sudden but of short duration, as people move on to the next big thing. Aries people may rant, rave and act like total loons when they’re worked up, but a half hour later they’re nothing but fine. Act like an Aries on a quest for the next challenge. Devise workarounds for whatever roadblocks you may encounter along the way. It’s like jumpstarting a car—if it won’t start, give it a few jolts and get right back on the road. Today’s a good day to ignore all things irate and agitated. It’s not a sin to be a little selfish today,so put up the “no trespassing” sign and give yourself room to focus on the essentials. Check your deadlines, organize your space, delegate what you can, delete all those junk emails, pop in earplugs if necessary and chug right through the day. Kozminsky Symbol for today’s Sun: “A man standing on a mountain gazing sadly on the valley below, where some men are fighting for a bag of gold whilst a monkey is eating their food. On his right is the spirit of Truth; on his left the spirit of Error; seated at his feet is the spirit of Love; behind him, holding on to his garment, is the spirit of Hate.”. Both of today’s Symbols say: “let me take you higher”. The keywords tell the tale: we’re talking intercession and revelation. Both involve the idea of evolution/raising our vibration. 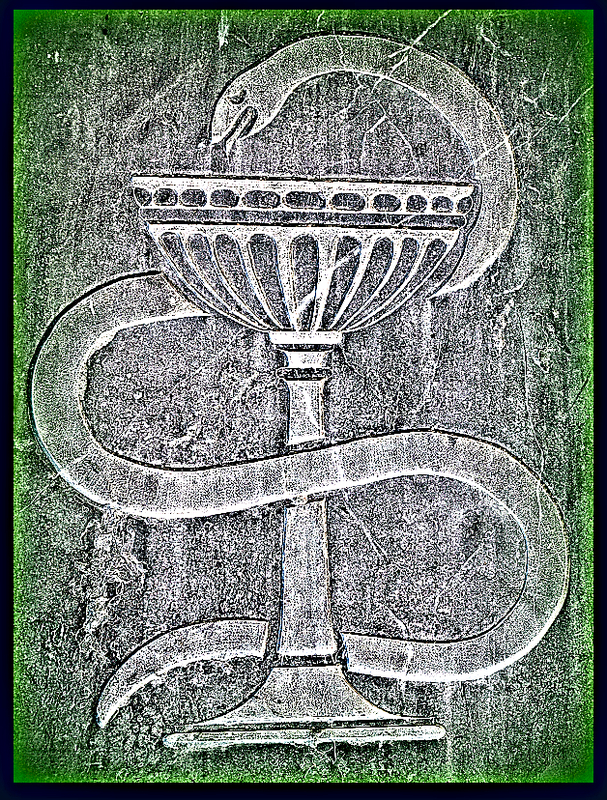 The Sabian Symbol, with the serpent between a man and a woman, echoes the biblical story of Adam and Eve and introduces the idea of serpent energy (kundalini), so it’s about opening the doors to divine awareness. In both cases the introduction of a new element forever changes the protagonists. The Adam and Eve story brings in the idea of a “fall” through temptation, which we can also see as improper use of all forms of energy exchange, including sexuality. The serpent relates to the sign Scorpio, whose ruler, Pluto, will be making a station soon (more on that in another Daily Astro), so the cosmos is gearing up for a huge shift and many will feel the pressure. This can manifest as compulsive behavior, so people may throw themselves at whatever temporarily relieves their anxiety. We need to find a way to channel our energy so it doesn’t burst forth destructively. The down side to this Symbol is a crazed recklessness, an inability to delay gratification, going overboard and impulsive behavior. The Kozminsky Symbol resembles an illustration of the Sabian Symbol pitfalls. It also reminds me of a Bosch painting depicting the deadly sins and follies of humanity. People fight over gold while a monkey consumes their food supply (wrong values and focus; emphasis on “animal instincts”) as a man on a mountain (ascension, spirituality, awareness) watches the scene ruefully. Kozminsky says this figure “seeks to find in man the spark which being agitated blazes forth in glory, guiding by its perfect light”. This is a perfect expression of Uranus in Aries energy—heat and light, fire of the mind and spirit leading to breakthroughs and new awareness. The man on the mountain is an intermediary, a teacher, ready to offer knowledge based on his own experience, but still conscious of all the temptations that lead people astray. The spirits of Error and Hate are present, just as the spirits Truth and Love are–the choice is ours.